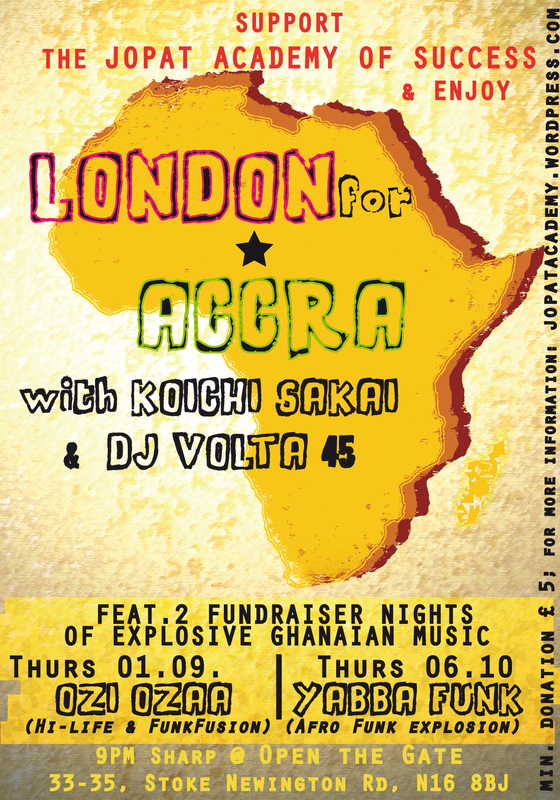 We are happy to announce our line up for the London for Accra Fundraiser Parties on the 1st of September at Open the Gate: Dj Koichi Sakai & Dj Volta 45 proudly present OZI OZAA !!! On Thursday the 1st of September, the African Hi-Life & Funk Fusion Band, Ozi Ozaa will perform an exciting style of Music and Dance born out of traditional West African Rhythms and Songs. Lead by Ghanaian Master Drummer Yaw Asumadu, fusing instruments and musicians from around the world. The music is inspired by African, Jazz, Latin, Caribbean, and Highlife music from Ghana; and is crafted by some of the UK’s most gifted musicians. Together, they create a unique and intricate blend of sounds; energy and infectious rhythms that will appeal to every type of audience. From London to Accra, we are aiming to fundraise £1000 to build a library in the Jopat Academy of Success, with the kindest support from London based, incredible gifted musicians and artists. “I was just employed at Jopat Academy of success when I achieved 90% in my exams conducted during the interview. 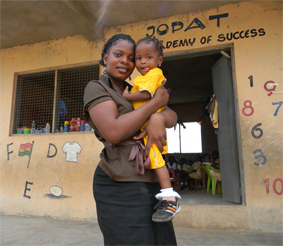 I have been here for just a month and I love working with the headmistress, Aunty Josephine, my co-workers and the kids. Working here is easier compared to other schools where I had taught. “Grandma”, as the children call her, has three grand children at Jopat Academy, who she brings to the school every morning. She volunteers to prepare food for the kids while the school’s cook, Aunty Salomy, is on maternity leave. We are three sisters and we have two little brothers at home. We stopped our old school and joined the Jopat Academy of Success. Before, we had to walk for a long time before we got to our old school. God’sway was always crying on our way to school because it was far from our house and we had to go alone. The Jopat Academy is close to our house, so Mother brought us here. 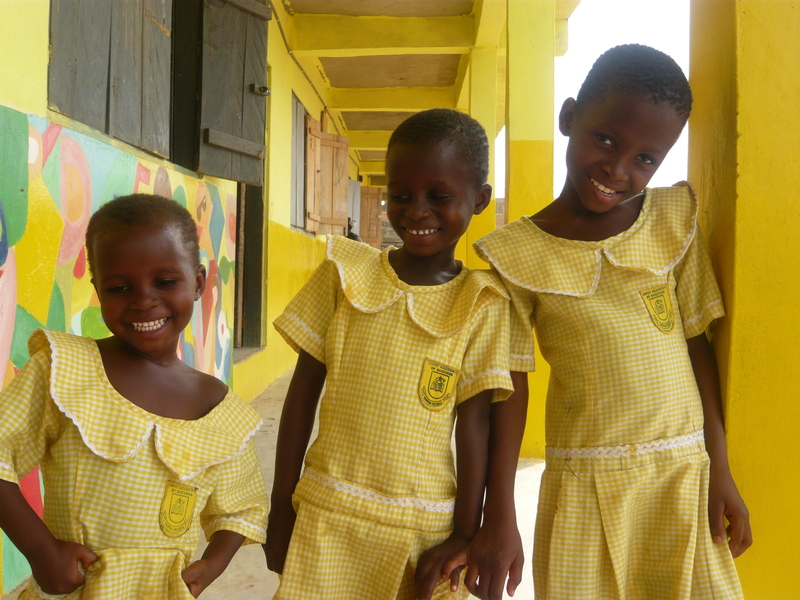 Our parents couldn’t afford the school fees for the three of us, so we hardly attended school every day. But at the Jopat Academy of Success, Ernestina doesn’t pay school fees, so my mummy says we will come to school every day. I want to come to the school every day to play with my friends. God’sway stopped crying too. We love the Jopat Academy of Success because we wouldn’t walk too far and are learning a lot.